We offer light-emitting diodes (LEDs) from the UV range (278 nm) to the NIR range (1300 nm). Depending on the area of application, they are available with different housing options: in a TO or SMD housing, as a chip only, or with a fiber optic connection. LEDs have the advantage that they consume a low amount of energy, produce very little heat, and have a long lifetime. Super luminescence diodes emit at peak wavelengths of 670 nm and 830 nm. Fiber-coupled ELEDs in an FC, ST, or SC housing or with a fiber connection. Our exclusive partner PD-LD Inc. assembles LEDs with a fiber connection or in an optical connector for fiber-optic data transmission, measurement devices, and optical sensors. 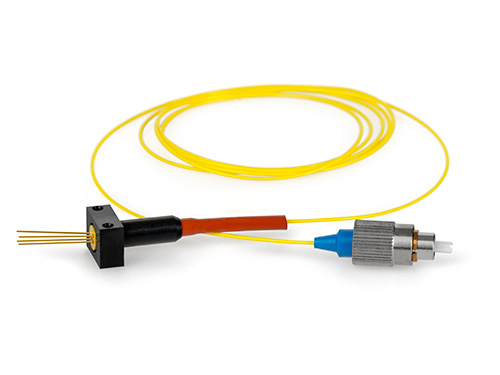 The fiber-coupled ELEDs are available in an FC, ST, or SC housing or with a fiber connection with a core diameter of 9 µm to 100 µm. The fiber tip is either bare or equipped with an optical connector.